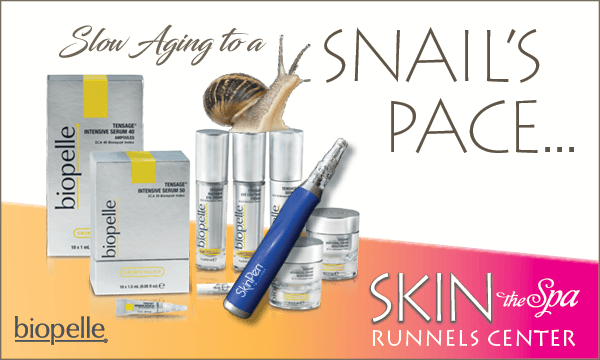 Slow Aging to a Snail's Pace: New Biopelle at SKIN! The rejuvenating power of snail growth factors from Biopelle is now available at SKIN the Spa at Runnels Center! This unique skincare line fights the signs of aging, while enhancing your skin’s tone and texture. Skin cells break down in the aging process and our body’s natural stem cells are less able to replace them. This natural process will lead to the appearance of wrinkles and fine line, even is we carefully avoid excessive sunlight and other damaging conditions. Enter Biopelle’s TENSAGE line, which is clinically proven to reduce the look of fine lines and wrinkles. When it comes to growth factors, We SNAILED IT! The TENSAGE growth factor line from Biopelle is the only physician-dispensed skincare line that is formulated with SCA Biorepair and CellPro Technology: a unique, natural ingredient derived from the eggs of the Cryptomphalus aspersa snail. This unique formula contains growth factors, antioxidants, and glycoproteins to helps repair, maintain and protect your skin from photo damage and other aging factors, while increasing elasticity and luminosity to restore a youthful glow. Snails may be slow moving, but this treatment combination is fast, with zero pain and only 24 hours of downtime. Try a microneedling session with our SkinPen Precision and say YES-cargot to a boost from Biopelle’s TENSAGE Intensive Serum! Right now, it's only $25 to add-on TENSAGE to your SkinPen session! SkinPen microneedling promotes collagen production on the face through deep penetration of topical serums for the regeneration of new, healthy skin cells. When paired with TENSAGE Intensive Serum, it significantly increases collagen production, improves the overall reduction of fine lines and wrinkles, reverses sun damage, minimizes scarring, reduces pore size, all while improving the tone and texture of the skin. Learn more on our blog. The TENSAGE serum can also help optimize other procedural outcomes and aid healing after both ablative and non-ablative procedures such as laser treatments, chemical peels, dermaplaning and more, while proving visible improvement in as little as 24 hours post procedure. For fast result, go slow and stop by SKIN the spa for your next microneedling session or try the new Biopelle skincare products! • Tensage Serum 15: All skin types can benefit from this elegant, oil-free daily serum to help improve the visible signs of aging. Additional ingredients include niacinamide combined with antioxidants, brightening agents and humectants. • Tensage Intensive Serum 50: Want dramatic improvement of moderate-to-severe skin damage from UV light, environmental and smoke toxins? This fast-acting serum produces quick results and is also formulated with antioxidants, glycoproteins, humectants, peptides and brightening agents to provide additional protection from daily damage and to help reduce the visible signs of aging. Great for daily use.